Established in 1917, a Japanese multinational corporation, Nikon has been the second major leader in the world of sports optics for past 100 years. Headquartered in Tokyo, Japan, the brand has now managed to claw its stand in the field of sports optics, cameras, camera lenses etc. Known majorly for its contributions to the world of cameras, the company has also made a significant influence on sports optics. A big contender in the sports optics category, the company strives to produce better and more efficient products posing a tough competition to other manufacturers in the market. Being a 100-year-old pawn, the company has now excelled in the art of producing efficient and favorable optics and is, therefore, most sought among the buyers. The success of the company depends on their guiding principle which revolves around making high quality, most reliable and affordable sports optics products which gives all other makers a run for their money. Their commitment to outstanding customer service and strong retailer partnerships is what makes them unmatched in their field. The USP of Nikon is that they certainly have something for everyone. Money never turns out be a constraint for buyers for the brand. The exceptionally well-designed binoculars that provide clear, crisp and well-focused imageries are not enslaved to the money thrown upon, rather sufficiently well performing optical instruments are also available for low prices. Having a top-notch customer interaction and dealings, the company has now become a conqueror in the field of sports optics. Being the king of optics, there certainly isn’t anything to be doubted upon, yet there are certain detailings one must look for while buying a Nikon binocular. 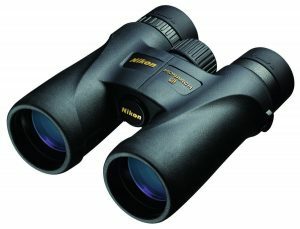 What to look for in Nikon Binoculars? Binoculars are a set of devices designed for the purpose of giving a long sight to the viewers, i.e. to enable them to view a distant object without going near to that. For such powerful devices to function well, there are certain parameters that need to be well crafted and looked upon for these parameters make and break a device. The better these parameters are, the stronger is the device functioning and hence better is its performance and acceptability. The major purpose of a binocular is to magnify distant objects so much so that a vivid image is visible to the viewers. This means that a pair of binoculars should have a sufficiently high magnifying power. Technically, the magnifying power of a binocular means at what distance the image appears in contrast to the original object. For example, if a bird at a distance of 1000 meters is viewed using a lens of 10x magnifying power, the bird would appear to be at a distance of 100 meters to the viewer’s eyes. However, the amount of magnification provided by a binocular directly affects the brightness of the image. The more magnified an image, the less bright it is. Therefore, it is important to strike an optimal balance between the two to attain a crisp image of the object. Field of view can be defined as a the area of scene visible from the objective lens of a binocular set. The perspective of the unit is always directly proportional to the field of view. Thus, a wide filed of view makes for a wider perspective. This, in turn, makes locating the objects through the lenses of the unit a simpler task as a larger region can be viewed than normal. The only downside of the a wide field of view is that the focus and clarity of the objects being viewed are reduces with the increasing value of field of view. The reason for this is that the magnification power of a binocular reduces with increasing field of view. So, it is vital that the sets are designed such that they maintain a balance between the two. The lenses present at the end opposite to the eyepiece are known as objective lenses. Objective lenses control the amount of light entering the binoculars and consequently, control its range of use. The larger the objective lens, the more is the amount of light entering from its surroundings, subsequently providing a better and brighter processed image. 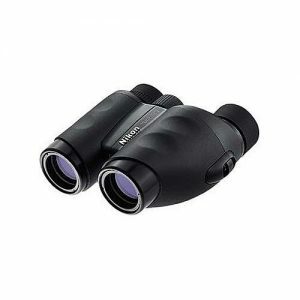 Binoculars having large objective lens are usually used in surroundings having low light, so as to allow better vision. The size of the objective matters a lot, as it not only controls the vision of the binoculars but also affects the overall size of the set in a proportionate manner. A larger objective lens makes for a larger size of the set. Every set of binoculars include the name of the objective lens used for it in its name, with its measurement specified in millimeters. Generally, the most efficient binoculars have an objective lens in the range of 30mm to 50mm as this range is most commonly used and efficiently serves the most purpose. A binocular set’s size and weight play a very significant role and thus, is considered important for in-land units. The weight of the set should be designed in such a way that it can be carried long distances easily, especially as it is used mainly on field adventures. Along with this, the binocular set must be designed keeping in mind its balance. A binocular cannot be judged for its balance without it being used properly. A binocular unit can only be said to be well-balanced, if it causes minimum stress on arms, wrists and elbows, thereby requiring minimum efforts during its usage while viewing. Eye relief is another factor that can only be judged after using the binocular set. Eye relief can be defined as the distance between the lenses of the unit, such that the image being viewed is in focus. Often, goggles or glasses come in between the eyes and the ocular lenses. This is the reason why eye relief for longer time periods is required, so that the processed image comes out to be focused and no hindrance is felt during the viewing process. For unobstructed vision, binoculars with an eye relief of 15mm or 16mm is recommended. Also, large values of eye reliefs negatively affect the field of view, and thus, it is integral that balance between eye relief and field of view need is maintained. 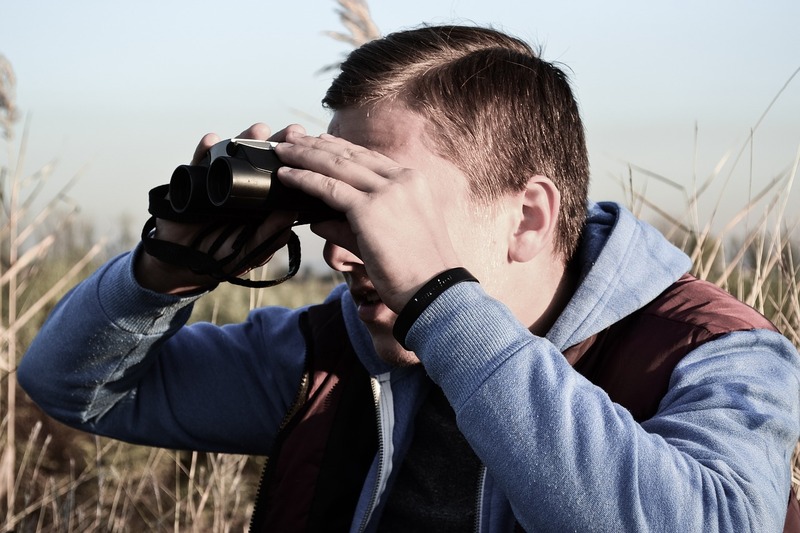 Since binoculars are essentially an outdoor device, it is important that they are waterproofed to a certain degree. Waterproofing ensures that the internal delicate optical parts do not get damaged by water retention and hence the performance of the binocular remains unhindered. 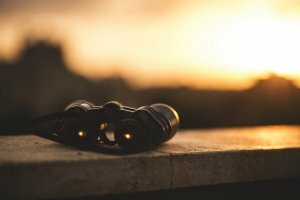 Though there are innumerable products in the category of sports optics under the Nikon banner, yet here is a list of binoculars best featured by the company, in all ranges for varied uses. 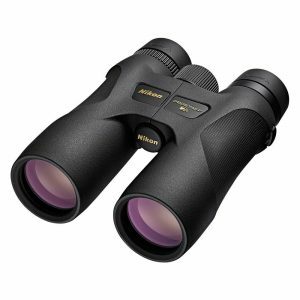 Built with Nikon’s premium ED (Extra-Low Dispersion) Glass, these Nikon MONARCH 5 binoculars provide sharper and clearer images with a more brilliant field of view. The fully Multicoated Eco-Glass Lenses provide a high light transmittance and hence a glare-free view. The device has various user-friendly features such as Turn-and-Slide Rubber Eyecups for better comfort to eyes, a Smooth Central Focus Knob for quick focusing of the lens and Flip Down Lens Caps to cover and protect the lens. Built for use even in harsh conditions, the MONARCH 5 is waterproof, fog proof powered with a rubber armored body for strengthened durability. The lens caps that come along fit loosely. 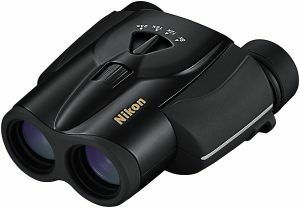 The Nikon 7548 Monarch 7 8×42 Binoculars are waterproof, fog-proof and can be used at all places irrespective of the terrain. They have extra-low dispersion (ED) glass elements that enhance brightness and color of the image and hence deliver images of excellent quality. The All-Terrain Binocular (ATB) series of Nikon promises to deliver images of impressive quality and ergonomics at an affordable cost, making it a favorite among all. The Monarch 7 8×42 provides an exceptionally wide field of view that makes it easy to find the subject and in real-time. The device contains dielectric high-reflective multilayer prism coatings that are applied to all the lenses to avoid glare and to produce sharp images with excellent contrast and color retention. The binoculars have a rubber armor that provides a strong grip and makes the device more durable. Being purged with dry Nitrogen gas makes the binoculars waterproof and fog proof. 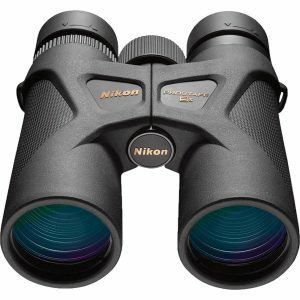 The Nikon Prostaff 7s 10×42 is binocular with a sleek and compact design that is built for any and all sorts of outdoor activities, making it a great accessory and a companion for nearly any adventurous outing. The device is designed with fully multicoated Eco-glass lenses and Phase-Correction Coated Roof Prisms. These technologies help PROSTAFF 7S deliver sharper images in terms of brightness and clarity. 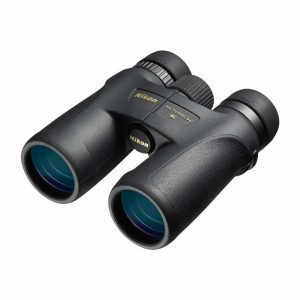 The ACULON A211 10-22×50 zoom binoculars feature adjustable multicoated lenses to prevent glare in images large objective lens to gather maximum light from the surroundings. These lenses are fabricated with Nikon’s exclusive lead and arsenic free Eco-Glass that add on to the quality of images. The BaK4 Porro prism systems within the binoculars deliver a high-quality image under all lighting conditions, making these binoculars effective during all hours of the day. 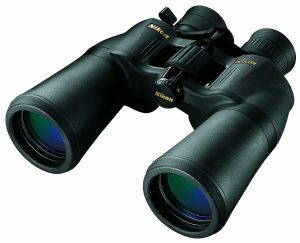 The Nikon 7279 Travelite binoculars are designed to provide the best experience of the binoculars within a constraint of cost. Designed with multicoated optics, these devices produce glare-free images. Equipped with a large central focusing knob, focusing of lenses on the objects is easier making images sharper. The outer coating of the binoculars is of tough rubber that acts as an armor to the inner optics and provides a strong and easy grip to the users. The USP of the MONARCH 7 series under the Nikon banner is its exemplary optical system, that provides seamless images. Like other MONARCH devices, this device is also built with Nikon’s premium ED (Extra-low Dispersion) glass and proprietary lens and prism coatings to enhance the viewing experience of the users. The device offers a wide field of view to cover maximum area of view, close-focus capability, and comfortable eye relief. Wide field of view to find the subject of view with ease. Dielectric High-Reflective Multilayer Prism Coatings that provide high-contrast images and accurate color reproduction. Durable rubber-armored coating to provide comfortable grip and durability. A centrally located zoom control lever enables the user to change magnification power and the focusing with an easy to use button at their finger-tips. Multiple layers of anti-reflective compounds is placed on all lenses that provide a superior quality of images. BaK4 high index prisms that provide extra high resolution to the images. Central focus knob to alter the magnifying power and focusing of the lenses at one click. The Nikon Action Extreme binocular with a Porro prism has all attributes of a waterproof and fog proof binocular. The Porro prism technology makes the binocular adaptable to all conditions and hence can be used without fear under all conditions. Made with Nikon’s Eco-Glass lenses and prism systems, the binocular delivers images of high-quality. The glass used is lighter in weight, therefore, make the overall body feather weighted. Large objective lens and better focusing and magnifying power. The PROSTAFF 3S 8×42 binocular-like others in its categories provide best viewing experience because of its exceptional features. With bright, multicoated optics, wide field of view, long eye relief, and waterproof/fogproof performance, the device covers all possible needs of a perfect binocular. The light-weight and compact design of the binocular despite of its rugged exterior make it even more desirable for all seekers. 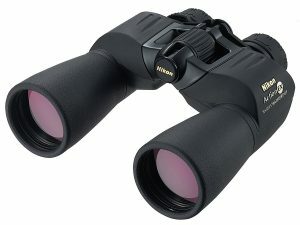 The Nikon Trailblazer Binocular 10×25, are waterproof and fog proof. Compact in design, the Trailblazer binocular has a sleek, lightweight body in unison with lead-and arsenic-free Eco-Glass optics. These optics provide crisp and sharp images with maximum brightness and color reproduction. 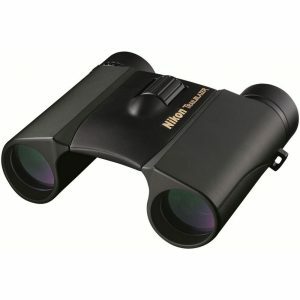 The outer rubber coating provides a comfortable grip and strength to the binocular. A crisp and sharp viewing is offered by the multiple layers of anti-reflective compounds. The device uses a large objective lens to gather light from the surrounding areas and direct them to the converging lens ensuring that the image produced is sufficiently bright. For past 100 years now, Nikon Corporation has been taking a lead in the world of optics with its flamboyantly well-crafted designs to suit the needs of all suitors. The experience of working in this direction has added much to the knowledge of the company making its flag fly high in the sky.